OK, you know you can't have the perfect cookout without hamburgers. We've all had our fair share of hockey-pucks, overcooked, tough and flavorless burgers. We're here to help give you advice so that your burgers will get rave reviews. I'll never forget the impromptu cookout we had and we used the pre-made supermarket burgers. My mother-in-law almost knocked me over when she loudly protested because I hadn't made my homemade burgers. Since then I've made them for her every time. Believe me, it couldn't be easier to make hamburgers your friends and family will rave about. There are just a few tips we'll give you here. First, don't use ground beef that's super lean (that's where hockey pucks come from). I remember Chef Michael Chiarello saying the perfect burger would have 30% fat. That's because fat is what gives a hamburger fabulous flavor and moisture. The best ratio is a mix of 85%-15%. The most flavorful meat is ground chuck. Remember, a burger with a higher fat content will shrink so you'll have to take that into consideration and make your patties bigger. I tend to make my patties about 1/4-1/2 inch bigger in diameter than the roll. Also, take care to avoid grill flair-ups when cooking with a higher fat content beef. The secret ingredient that my mother-in-law raves about? Lipton Onion Soup Mix. That's right. It's the perfect seasoning for hamburgers. I add two envelopes of Lipton Onion Soup Mix to two pounds of ground beef. I also add one large egg just to help hold things together. I've also learned to not over mix. Over mixing will definitely toughen the burgers. If I've stored the hamburgers in the refrigerator I take them out of the refrigerator at least 15 minutes before we cook them. No matter what type of meat you're cooking, burgers, steaks, roast, chicken, etc., always bring it to room temperature before cooking. Of course the fattier the meat the more the potential for grill flare-ups. 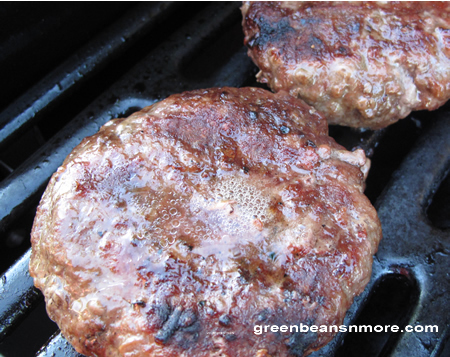 These flair-ups can result in burgers that are charred on the outside and rare on the inside - not good. We find there are less flair-ups at medium heat. Always pre-heat your grill for at least 10 minutes, 15 minutes is better. Cook the hamburgers over direct medium heat. Cook a 1" thick burger 6 minutes per side for medium well, and a 1 1/4" burger 9 minutes per side for medium well. To be sure you're safe you can check it with a meat thermometer and it should register 160°F. Remember, every time you open the grill lid you will lose heat. Try to open it as few times as possible. What you should do is put the burger on the grill and leave it for the suggested time. Then flip it over. It should not stick to the grill. Resist the urge to move the burgers around too much, that's how they break up. Also, NEVER push down on your burger with a spatula. All you're doing is pushing out the juices. I usually keep a burger that I use for the "sacrifice". If I think the burgers are nearing done I take the sacrificial burger off the grill and cut it in two. If it's done to my liking the others come off the grill. If not, they're cooked a few more minutes.